Raphael produced a large body of work despite his early death at age 37. Many of his art pieces are found in the Vatican Palace. One of his best known paintings is on a wall in the Vatican, and it is our painting of the week, The School of Athens. The School of Athens is considered to be Raphael’s masterpiece and a perfect example of the classical spirit of the Renaissance. The painting represents Philosophy. Nearly every great Greek philosopher can be found in the painting. Raphael even painted Michelangelo, Leonardo, and himself into the scene. 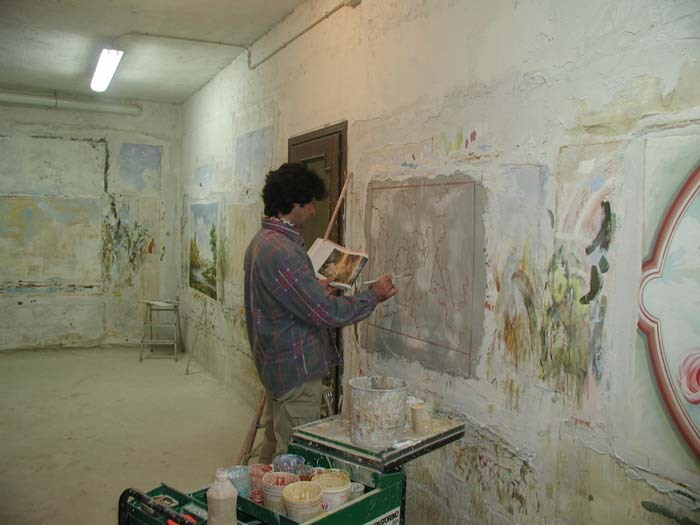 Wall painting was very popular during the Renaissance and fresco was the main method of decoration. Fresco, the Italian word for fresh, is a form of mural painting in which colored pigments are painted directly on fresh, wet, lime plaster. 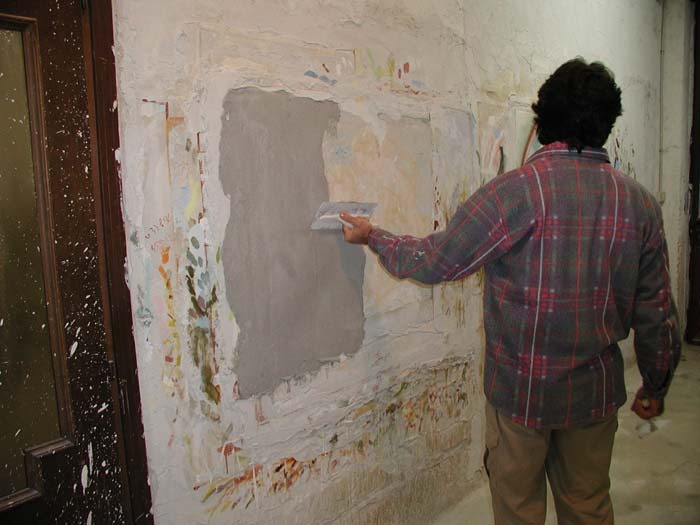 As the plaster dries, the colors and plaster bond together. The area to be painted was first covered with an under layer of plaster. 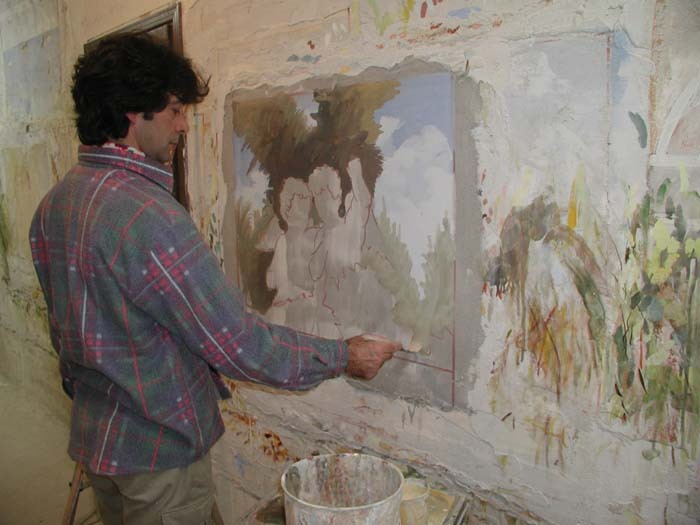 Then the main layer of plaster was applied which the artist had to brush his colors into. The artist had to complete the painting before the plaster dried, which was only about 8 or 9 hours. Since a painter couldn’t finish a big painting in just one day, he would work in sections, completing part of a painting each day. If mistakes were made, that day’s layer of plaster would have to be scraped away and he would have to do it all over. Raphael is known for his many paintings of the Madonna and Child. The Madonna is a name for Mary, the mother of Jesus. Raphael completed most of his Madonna paintings while living in Florence. His Madonna paintings show his ability to paint human warmth, a sense of peace, and beautifully perfect figures. Two of his most famous are The Madonna of the Beautiful Garden and the Sistine Madonna. Raphael’s art truly represented the Renaissance qualities of harmony and ideal beauty. Raphael’s Sistine Madonna is one of his most famous. People wonder about the Madonna and child’s expressions of worry. But the main reason this painting has become so famous is not the Madonna and child themselves but the two cherubs painted at the bottom. Raphael added the angels as an afterthought, simply to improve the painting’s composition. By looking above, the pair help pull the viewer’s eye upwards, to the Mary and Child at the heart of the painting.